Which Windows edition should I choose? Published: Tue 26 September 2017 in Cookbook. For those who may find the difference between core, standard, essentials, enterprise, professional, datacenter & others a bit hard to grasp. Windows editions follow a naming convention which may not be the clearest and, to make things worse, change with Windows versions and cover both technical and non-technical differences (meaning that two different editions may actually be the same with just a different EULA). Here is a short post on main Windows editions with a focus on the version you may prefer for your lab. Windows Home or Core edition is the low-budget, consumer grade version of Windows. It is enough for home uses, but is missing features necessary for corporate environments such as the ability to join an Active Directory domain. Windows Professional or Business edition adds more functionalities, such as the ability to join an Active Directory domain and disk encryption (limited to the Enterprise edition and above until Windows 7 included). Published: Thu 21 September 2017 in Projects. Learn hos to fork, merge, and otherwise manipulate and diagnose vmtools virtual machines. Still with me? In this second part of the vmtools guided tour (read the first part first! ), we will now enter in the core of the subject and learn how to manage virtual machines, and in particular how virtual machines forks and merges work. As before, if anything seems unclear or would warrant more explanation, feel free to contact me. vmup is useful to boot a virtual disk image, but it doesn’t save the virtual machine settings and does not provide access to vmtools more advanced features. Published: Mon 18 September 2017 in Projects. Install vmtools and use vmup to boot disk image files. This the first of a short series of posts introducing vmtools main features. We will start in a gentle way by focusing on a single but central command: vmup. Feel free to contact me if anything seems unclear or would warrant more explanation. To uninstall vmtools, use the provided uninstall.sh script. System-wide settings are stored in the file /etc/vmtools/vmtools.conf, this file is optional and must be manually created. This file lets you centrally configure the default settings to apply to all your virtual machines. Published: Sun 17 September 2017 in Projects. vmtools is a Qemu virtual machines manager which strives to be easy, versatile and modular while adhering to the principle of least privileges, to respect users’ freedom and security. Easy: Just vmup anything which can be booted, from a local disk image file to remote URLs including .ova archives and devices files. No complex parameters to set or remember, just boots the damn thing. Virtual machine settings are saved in short and clean plain-text files. No XML, no unneeded settings, only the non-default values specific to the virtual machine, easily readable and editable with any text editor. Versatile: Use it how you want, vmtools does as few assumptions as possible. No imposed directory structure, no imposed work-flow. Saved virtual machines are standard directories and files which can be moved, copied or renamed at will, but can also be freely forked and merged to match even advanced work-flows. Published: Fri 08 September 2017 in Cookbook. A mind-refresher on SELinux main commands, files and behavior. This page is only designed as a memory-refresher. SElinux may be a complex thing to get right, if you are not familiar with it yet I highly encourage you to read Sven Vermeulen books. From a script, selinuxenabled doesn’t produce any output and its exit code gives SELinux status. From an interactive prompt, sestatus provides more information. enforcing: Enabled and block unauthorized actions (policy violations). permissive: Enabled, but only logs unauthorized actions and does not block them (useful for development and HIDS purposes). If SELinux has been temporarily disabled (which is not recommended, there are usually cleaner ways to proceed), a global relabel will be required before re-enabling SELinux. Published: Wed 06 September 2017 in Library. 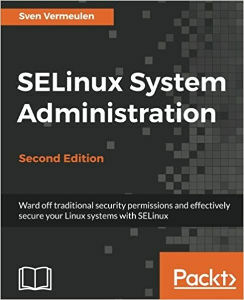 The best book to discover SELinux and learn how to take the most out of it. Sven Vermeulen, the author of these two books, is deeply involved in the Gentoo community. In 2003, he joined the ranks of the Gentoo Linux project as a documentation developer and has since worked in several roles, including Gentoo Foundation trustee, council member, project lead for various documentation initiatives, and (his current role) project lead for Gentoo Hardened SELinux integration and the system integrity project. He is both knowledgeable technically, pedagogically and in SELinux. In these books, he uses his talent to spread the light on a domain which is often conceived as obscure and daunting, explaining in a clear and effective way how and why the things are the way they are so everything finally takes its place into our minds. A step-by-step guide to get legacy ASA images and ASAv up-and-running a virtual lab. The Cisco Adaptative Security Appliance (ASA) is Cisco’s main firewall and network security product. It mainly provides firewall and VPN services, but its native features can be enhanced with the addition of FirePOWER NGIDS services on top of it. Even when used on top of an ASA in the same appliance, the FirePOWER NGIDS is never really merged within the ASA but stays a separate module. For instance, the ASA and the FirePOWER each have their own separate CLI shell, each with their own different syntax and logic. In fact FirePOWER is not a Cisco development but has been acquired when Cisco merged with SourceFire, hence the (personal) feeling of an “alien” product plugged into the ASA.